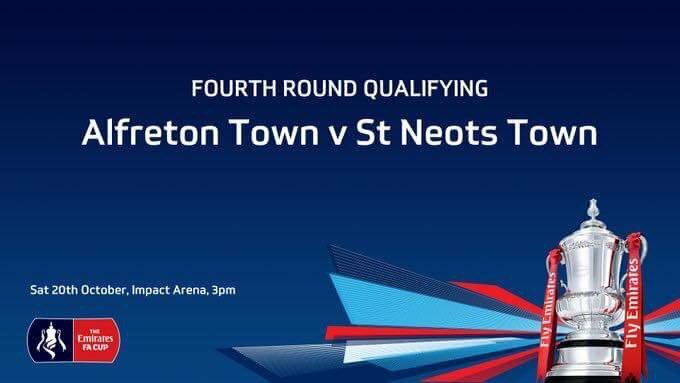 Alfreton Town are back in Emirates FA Cup action tomorrow afternoon, as Evo-Stik Southern League Premier division side St Neots Town visit the Impact Arena for a huge Fourth Qualifying Round tie; kick off is 3pm. The Reds are looking to book a First Round proper appearance for the first time since the 2016/17 season when we took Newport County to a replay after a 1-1 draw at the Impact Arena. Alfreton will also be looking to respond from last weekend's defeat to Altrincham in the National League North, our fourth league defeat in a row. The Reds never got out of the blocks in the opening half an hour and we found ourselves 3-0 down after just 25 minutes. It was a strange first half from the Reds who looked out of character, especially at the back and lacked urgency in attack. We pulled one back mid-way through the second half thanks to Richard Peniket's strike but ultimately the damage was done in the first half. A revival of league form is certainly one of the main things on the list for the Reds at the moment, but a huge game awaits us tomorrow in the FA Cup. A response from Saturday will also be top of Billy Heath's list as Alfreton look to get back on track and in turn book a place in Monday's First Round draw. Our journey in this season's FA Cup has seen us draw 2-2 at Sutton Coldfield Town in the Second Qualifying Round before winning the replay 3-0 at the Impact Arena. We then travelled to rivals Mickleover Sports in the Third Qualifying Round and progressed 2-1 at the Don Amott Arena. Our visitors have certainly been one of the stories of the early rounds so far, labelled as 'comeback kings'; the Saints started their FA Cup run at home to Bishops Stortford, after falling down to ten men on the half hour mark, St Neots battled to a 2-1 win. Another home tie came in the Second Qualifying Round as Step five Romulus visited, the Saints found themselves 3-0 down after 17 minutes but an unbelieveable come back saw St Neots win 4-3. A third home tie came as Coalville Town visited in the Third Qualifying Round and took a 2-0 lead only for a late stoppage time goal from the Saints to level the game at 2-2 and earn a replay. The replay served up yet more drama with the game ending 3-3 after extra time, St Neots found themselves 3-1 down with ten minutes of normal time to play but once again scored two late goals to level the contest and then they progressed on penalties to book a Fourth Qualifying Round spot for the first time since 1966. St Neots league record so far: P10, W2, D3, L5, Points 9, Position 19th. The Reds will be boosted by the arrival of Sam Hird who joined the club this week. We hope to see as many Reds as possible tomorrow as we look to book our place in the First Round proper!